Greenpeace activists smeared messages on the vessel with raw crude from the Gulf Coast oil spill. (CNN) -- Seven members of the environmental group Greenpeace were arrested Monday after protesting at a private ship that the group says is scheduled to depart for Alaska this summer as part of a drilling mission. The group said it was sending a message to Interior Secretary Ken Salazar to ban new drilling in the Arctic or any U.S. waters. The ship was docked at Port Fourchon, Louisiana, near the site of the massive BP oil spill that for more than a month has been gushing thousands of barrels of oil daily into the Gulf of Mexico. Photos from the scene show two protesters repelling off the side of Harvey Explorer, a 240-foot supply vessel, with one holding a sign reading "Salazar: Ban Arctic drilling." 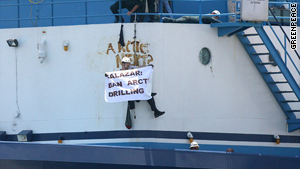 The activists also smeared messages -- "Arctic next?" -- on the boat in raw crude from the BP spill in the Gulf. The seven arrested, between ages 24 and 32, face unauthorized entry charges of a critical infrastructure and an inhabited dwelling, according to the Lafourche Parish County Sheriff's Department. They could face additional charges pending an investigation into the incident, authorities said. The protest comes as the Obama administration has decided to establish a presidential commission to investigate the disaster and look into federal oversight of offshore oil drilling, safety aboard rigs and environmental protection. Permits to drill offshore were suspended last month pending an Interior Department safety review after the explosion of the Deepwater Horizon drill rig. Still, the government is under pressure to issue new permits for offshore drilling as early as next week. The safety review is due this Friday, and the Obama administration will use it to help decide when and how drilling should resume. The Harvey Explorer is a vessel contracted by Shell for offshore operations off the Alaskan coast that had been scheduled for July. "The safety and security of this contracted vessel and its crew are a top priority," Shell said in a statement Monday. "While we welcome discussions regarding Shell operations, we are disappointed in the approach taken by Greenpeace today." Greenpeace and other environmental groups argue there should be no new drilling until the investigation into the disaster is complete, which will take months. "As long as we continue to rely on dirty and dangerous fossil fuels and offshore drilling, we can't prevent future disasters from destroying our oceans and the industries and wildlife that depend upon them," said John Hocevar, oceans campaign director for Greenpeace. "Pulling the plug on plans to drill in the Arctic would be a first step towards a comprehensive ban on all new drilling in the United States," he said.